A retainer of Emperor Daigo (also called Engi no Mikado) goes to Lake Biwa in order to pray at the shrine of Benzaiten (Sarasvati) on Chikubu-shima Island. The retainer takes passage in the fishing boat of an old fisherman with a young woman whom he met on the shore, sailing for the island in the lake. While enjoying the peaceful scenery of the lake in spring, the boat reaches Chikubu-shima Island. 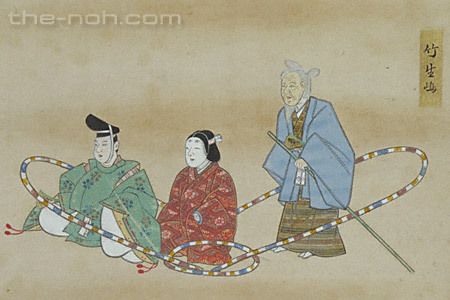 The old fisherman leads the retainer to the shrine. Since the young woman accompanies them, the retainer asks the fisherman whether the landing of women on the island is barred. The two then respond that this island does not prohibit women since it enshrines Benzaiten, who embodies femininity. 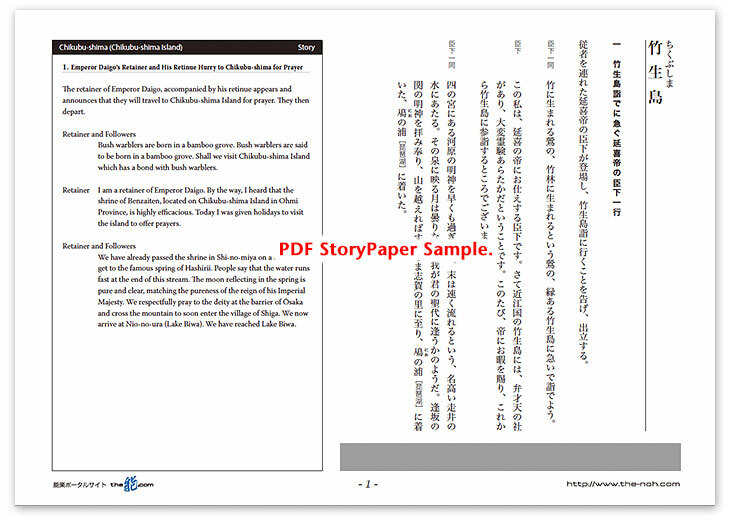 They narrate the origin of the island for the retainer. After the story, the woman reveals that she is not a human and enters the shrine. The old man also reveals that he is the spirit of Lake Biwa, who rules over the lake. He then disappears between the waves. During the time the retainer spends at the shrine, he is allowed to see the treasure of the shrine by a Shinto priest, when the hall of the shrine rumbles with the glowing vision of Benzaiten, or Sarasvati. Sarasvati in the form of glorious celestial maiden plays nocturnal music for dance. Eventually, around the time when the moon serenely and clearly shines over the lake, a dragon deity appears from within the lake. The dragon deity offers precious gems to the retainer and forms the figure of blessing. Then, they show the vow to rescue all living creatures from sufferings that she sometimes turns into a maiden from the celestial world to oblige the living creatures by making their wishes come true. On other occasions, he disguises as a dragon deity living on earth and peacefully rules the land. After showing the vow, the celestial maiden enters the shrine, and the dragon deity splashes himself in the waves of the lake and jumps into the Dragon King’s Palace. Chikubu-shima Island is a small island in the northern part of the largest lake in Japan, Lake Biwa. The island blessed with lush greenery has been distinguished as a sanctuary since ancient time. A shrine had already been established around the fifth century. Sarasvati, a divinity closely related to water, became enshrined in this island and gathered people’s sincere belief. The scenic beauty of the lake, including Chikubu-shima Island as one of its details, has been lauded and enjoyed by the residents of Kyoto, which is located behind mountains from the lake. This Noh drama develops an invigorative divine story in the mild, peaceful spring scenery of Lake Biwa and Chikubu-shima Island. Even from the first half, this piece proceeds airily in an up-tempo, and the second half includes highlights such as the dance of the celestial maiden and the maibataraki of the dragon deity. With the plain refreshing atmosphere, the audience of this piece will feel the atmosphere of beautiful spring and become happier.